May 30, 2015: Akemi’s big hair day! So, whaddya think? Who should she be cosplaying at the San Diego Comic Con? Before heading in for her 8 hour hair sessions, Akemi and I entertained our friend Jessie – Canada’s future Prime Minster! Alas, I think this phage treatment may come too late for my gal. Like yesterday, she slept through most of the day (Bubba, above, offers up a sympathy nap). She didn’t have much of an appetite so I rectified that by picking her up a tasty burger, bypassing the Wahlburgers next door (I said “tasty” after all) for the Burgers Priest four blocks up and three blocks over. Worth the trip! She ate the entire patty (minus Bubba and Lulu’s cut). May 27, 2015: Another Dark Matter sneak peek! Don’t mess with the Zobot! More behind the scenes pics! What to expect from SyFy’s new space opera! When he’s not traveling around the world on business, reading scripts, giving notes, weighing in on prep, visiting set, or editing, Executive Producer Jay Firestone finds time to socialize – pictured above with Director Bruce McDonald. You should get that looked at! May 26, 2015: Akemi! Dark Matter! And friends! – Akemi elucidating on the topic of cannibalism. – Akemi’s way of letting me know she’s hungry. – Akemi passing judgement on my Facebook activity which is entirely comprised of me sharing missing pet and adopt-a-dog posts. Get your Dark Matter t-shirts! May 25, 2015: The Dark Matter rollout! Introducing Melissa O’Neil as TWO! Finishing up my overview of our wonderful cast, we finally come to the character of TWO. May 24, 2015: The Jelly Update! May 23, 2015: The Dark Matter Deluge! Give it a read and leave him a thank you for bringing you some much-missed ship-based scifi! And your new favorite SF series! SyFyNL is offering up the opportunity to win a trip to San Diego Comic Con. See you there! 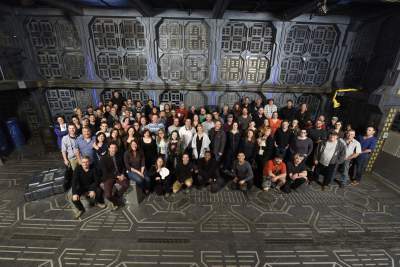 May 20, 2015: And that’s a wrap on Dark Matter’s first season! The Dark Matter gang. I’m going to miss them! Annnnnnd we’re done! More or less. I’ve still got my producer cuts of episode #112 and #113 to complete, all the mixes to sit through, and visual effects to approve but, for all intents and purposes, production on Dark Matter’s first season is complete. It’s hard to believe that this time last year, I honestly didn’t think the show was going to happen. And yet here I now sit, with 13 episodes under my belt, putting together a game plan for season 2. Thanks to everyone who took the time to offer well wishes and words of support for my gal Jelly. She seems to be back to her old sleepy/hungry/cantankerous self. Sadly, however, this rebound will be short-lived. According to her latest rest results, she’s suffering from an antibiotic resistant infection that has spread through her intestines and kidneys. The doctors suggest we consider end of life before she develops septic shock. Dinner with actor Roger Cross. Rum cake and ice cream from Don’t Call Me Cupcake! The gang working on their tans. A visit from cousin Clover. Jodelle steals my Thai iced tea. A selection of SOMA Chocolates. Vancouver swag compliments of my foodie friend Nicole. Nicole gives Buca Restaurant the thumbs up. May 18, 2015: The Dark Matter rollout! Introducing Zoie Palmer as The Android! “Zoie!! !” is the reaction the Android elicits from my girlfriend every time she pops up on my laptop. I’ve screened 11 of 13 prod cuts for Akemi and, to date, she loves the show, loves all of the characters, but is especially fond of Zoie’s Android – which leads me to believe that #zobot is going to be BIG in Japan when the show airs on SyFyAsia in June!